Local Students Put On “Concert For Life” Tonight! #Sackville (Please Share This One Around) | Sack-Vegas!!!! 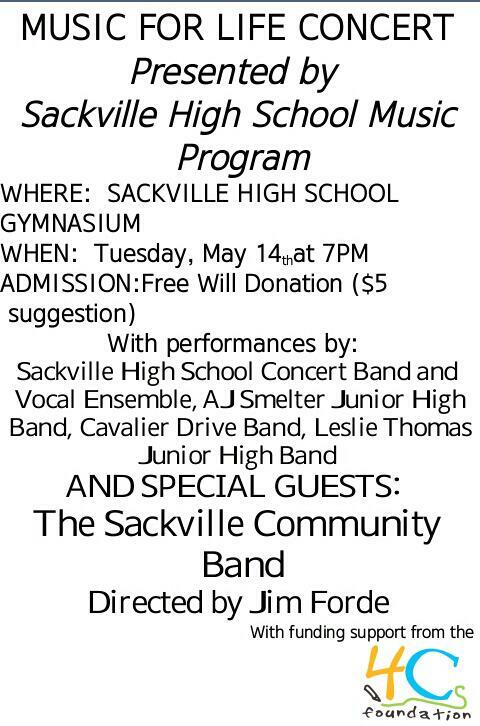 The Sackville High School Music Department will present their third annual Music for Life Community Concert at Sackville High School on Tuesday, May 14th at 7pm in the Sackville High School Gymnasium. The audience will be treated to an evening of choral and instrumental music featuring performances by our community school music programs as well as special guests, the Sackville Community Band. The Music for Life Community Concert is part of a community music project that is presented with funding support from the 4Cs Foundation, which provides grants for community arts projects that inspire, empower, and connect children and their communities. Over the past three years, members of the Sackville Community Band as well as members from the wider musical community have acted as musical mentors to instrumental students at Sackville High School. Please help us celebrate and showcase the power of youth and adult collaboration through music and the community of Sackville. This will be an exciting performance, a wonderful opportunity to support arts education in our public schools and a marvellous showcase of Music for Life in Sackville. Posted by Sacky on May 14, 2013 in Sacktown Talent, Uncategorized and tagged Concert, Sackville.